Key Difference: Hawks are birds of prey that are usually smaller in size and have less weight. Falcons are birds of prey that have long pointed wings and an intended (concave) beak. 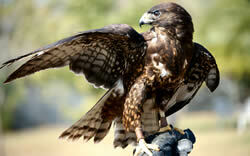 Hawks are birds of prey that are usually smaller in size and have less weight. Hawks tend to hunt by sudden dashes from a concealed perch in trees. They usually reside in wooden areas; and are considered to be among the most intelligent birds. These large-to-medium-sized hawks are usually about the size of some of the smallest eagle species. Falcons are also birds of prey. They are small with a strong angular beak. An angular bend on their beak allows them to easily break their prey’s neck. They belong to the same genus; and have a notch on their beaks. Falcon scientific name is ‘Falco’, and it category is Genus. Vary in color; most are gray or reddish brown on top and whitish underneath. Usually the bills are black, the feet yellow, and the talons black. Female are usually larger than their male counterparts. The difference between male and female falcon is not that evident, but the color and the pattern of the chest and throat are the best indicators. Usually have darker spots or streaks on the neck, breast, and legs and darker bars on the tail and wings. The wings are wider in relation to their bodies and have rounded ends. Their legs are feathered, in some species right down to the toes. They have long, slender wings that are pointed at the end; the wings are wider in relation to their bodies. Smaller birds and land animals, such as rats, mice, gophers, rabbits, and grasshoppers, depending on its habitat. Small birds, such as doves and pigeons, depending on its habitat. Mostly hunt by day; bat hawk of Asia and Africa, hunts at night. Hunt by sudden dashes from a concealed perch. Use a variety of techniques to seek, attach and kill prey. They dive and catch their prey by surprise, so the speed kills the prey instantly. Bulky nests of sticks on rocky cliffs or hills, or in trees. A few species nest on the ground. Nesting on man-made structures such as buildings and cellphone transmission towers. Whitish or light blue usually spotted with brown that number between two to seven. Whitish eggs with dark brown markings that number between three to four. Covered with white down, looked after by both parents, able to fly after 4 to 6 weeks. Female lays 3 to 4 eggs, and both birds keep warm or hatch them for 4 to 7 weeks.